The Read All About It rapper said he goes through phases of being down and also struggles with obsessive compulsive disorder and anxiety, and explained that it can be tough because some assume that life is perfect for people in his position. 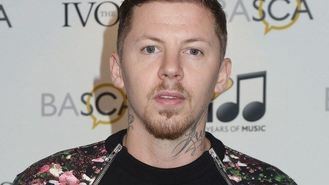 Pro Green, whose new single Lullaby is about depression, told Metro: "My father committed suicide and I suffer with depression - it's not manic, thank god. I don't even realise when I get down, my OCD gets a lot worse. I'm [also] a complete hypochondriac. 'It's not cool and manifests in so many different ways that you don't even realise: anxiety is a difficult thing to have to deal with too." The singer, who is married to former Made In Chelsea star Millie Mackintosh, went on: "The worst part is people assume that those in my position and of others in similar circumstances, that everything is perfect - if you've got a good job, a wife, then everything must be fine, you're not allowed to feel down about it. 'It's even worse for yourself when you go 'I don't know why I feel how I feel, but I do'." The star, whose real name is Stephen Manderson, added: "The most important thing to do is talk."